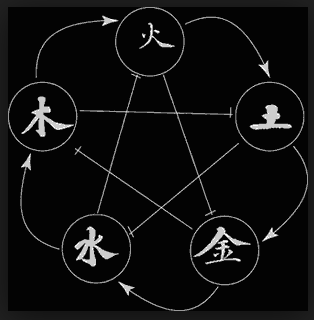 “The system of the wuxing forms an integral part of what A.C. Graham has called the “correlative cosmology” that had taken shape by the early imperial age under the Former Han. Various English translations have been attempted, but the “five agents” and “five phases ” are nowadays most commonly used by scholars.”—Christopher Cullen. “With the fivefold scheme [compare with Yin and Yang thinking], however, the potential relationships are considerably more complex. The phases or agents are ordered in two ways: the “production” or “generation” sequence (xiāngshēng 相生) and the “conquest” sequence (xiàngkè 相克). It is easy to see the way the two sequences work, at least with reference to the natural entities after which the phases or agents are named. In the production order, Wood grows using Water; Fire can come from Wood; Soil (ashes) comes from Fire and (as all ancient people thought) Metals grow in the Soil; finally Water condenses on cold Metal. Turning to conquest, Water extinguishes Fire, Fire melts Metal, Metal cuts Wood, Wood (as in an ancient wooden spade) can dig up Soil, and Soil can dam up Water.”—Christopher Cullen. “Like the Yin-Yang scheme, the wuxing emerged from the intellectual ferment of the late Warring States (403-221 BCE) in ways that are not easy to trace in detail. There were certainly alternative schemes stressing different numbers of categories. 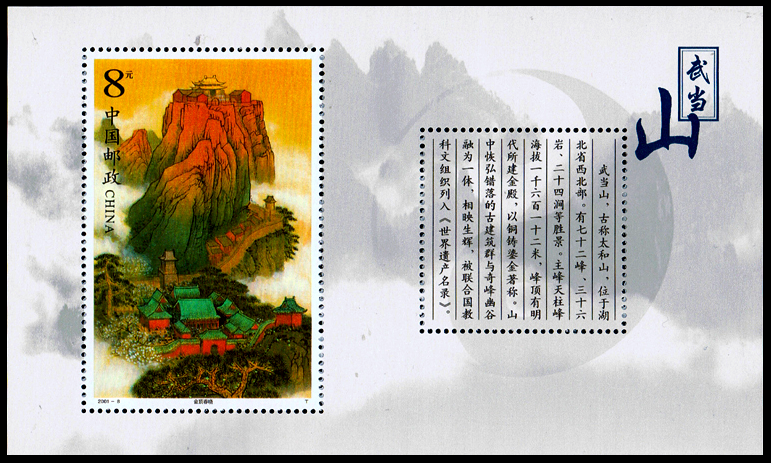 The Lushi chunqiu lushi (Spring and Autumns of Mr. Lu), which was assembled in 239 BCE, gives the first full and clear evidence of the scheme in action, and its application was developed further during the Former Han. Traditional attributions to Zou Yan (third century BCE) as a major innovator in wuxing thinking are probably baseless. At most he may have stressed the application of the scheme to the revolutions of political power, with each succeeding dynasty arising in connection with one of the phases or agents.”—Christopher Cullen, the author of article in the Encyclopedia of Taoism. Very often and good enough people understand the first principle, (1) “generation sequence” (xiāngshēng 相生), and the second, (2) “conquest sequence” (xiàngkè 相克). I would like to remind — lets call it — the third and the fourth principles, which I have met long ago while reading Sistematische Akupunktur by Porkert/Hempen, “control sequence” and “masking sequence”. For example, (3) Wood destroys Soil, but Metal controls the process, and (4) Wood destroys Soil but Fire masks the process.—Basil Lenkov. The images of the internet search (a keyword “五行”) can be quite impressive, but somehow very important aspects disappear behind the colors and volumes of the pictures. 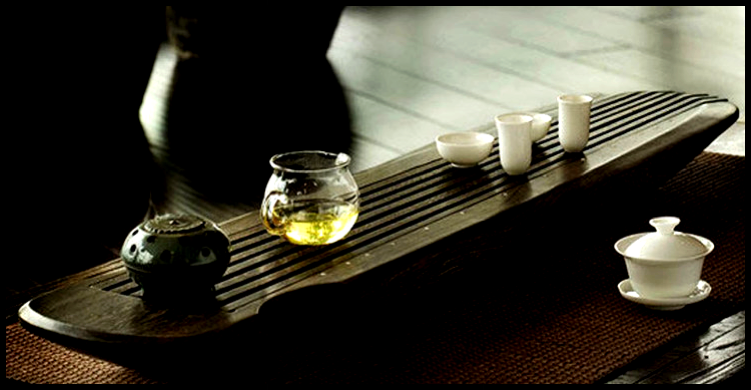 For example, a rare author can place Soil in the center with Wood and Fire as a Yang aspect, and Metal and Water as an Yin aspect.—Basil Lenkov. Once again, when Soil is in the center, we can see two axes: (1) axis of potency from Wood to Metal, and (2) axis of reality from Fire to Water. In general it gives us a lot of information for meditation because in such case we shall have Wood as potential action, Fire as real action, Metal as potential structure, and Water as real structure. Any table of words in cluster of five will look much better, beginning from the first column under Wood, the second under Fire, the third under Soil, the fourth under Metal and the fifth under Water. It looks classy, it looks reasonable, but it cannot be found so often online.—Basil Lenkov. The table of words organized as clusters of five online can be different in size, for a simple illustration “13 lines” table was chosen, but I have to say that in my collection I have “31 lines” of symbolic correlations, and there is a book which gives more than 100 lines. For those who read German: Eberhard W. Beiträge zur Kozmologischen Speculation Chinas in der Han Zeit ll Baessfer Archiv. 1933, No 16. My own precious source goes, as far as I can see, to Needham J. Science and Civilization in China, Cambridge.—Basil Lenkov, Sri Yantra Master. That is funny to remember the phrase ‘the doing of the right thing at the right time’ as it was said in the movie The Big Lebowski and of course, that is the thing which turns a man into the man, mensch. So, two different civilizations actually have so much in common recently and are so close to each other (almost as in the picture of world leaders in Brisbane, Australia 2014, with American and Chinese presidents in the center). I though a bit, what I could possibly add to a couple of citations above, and you know what, I have decided to do nothing, 無為 (wuwei), just reread it again and get another second of agreement somewhere deep inside my heart again. Isabelle Robinet is the author of all citations here. There is a random order of them, just in the way I like to reread my synopsis from time to time to keep myself in the form. By the way, Encyclopedia of Taoism doesn’t practice tones’ settings but I do.